Length Overall : 54' 9"
Sail Area : 1,657 sq. ft. The Moorings 54.5, the new flagship yacht of the Moorings monohull fleet and the largest in the fleet to date, is a spacious and luxuriously outfitted yacht with performance to match. 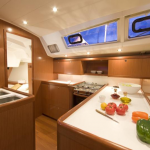 It has equipment and a layout that is easy to manage either under sail or docking. With a powerful mainsail, roller furling jib, all sail controls led to the cockpit and two steering wheels for excellent visibility she is fun and easy to handle. 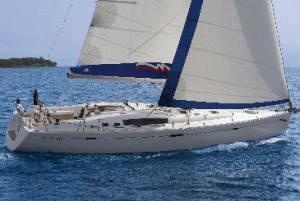 The addition of bow thrusters and electric winches for all sail controls make it a pleasure to operate. A full suite of navigation electronics, including oversize color chartplotter, autopilot, sailing instruments with digital monitoring of your systems such as battery banks and water levels add to the ease. For added enjoyment a complete entertainment system is provided with TV/DVD player, CD player with cockpit speakers and MP3 connection for your digital music. 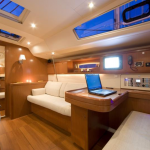 The yacht even includes an inverter to enable you to recharge all of your cameras, phones and other electrical components without running the generator. 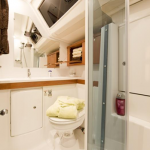 The interior of the Mooring 54.5 features 4 double staterooms and crew quarters in a forepeak cabin. 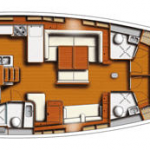 The double cabins are very spacious and bright with numerous opening hatches and portlights. 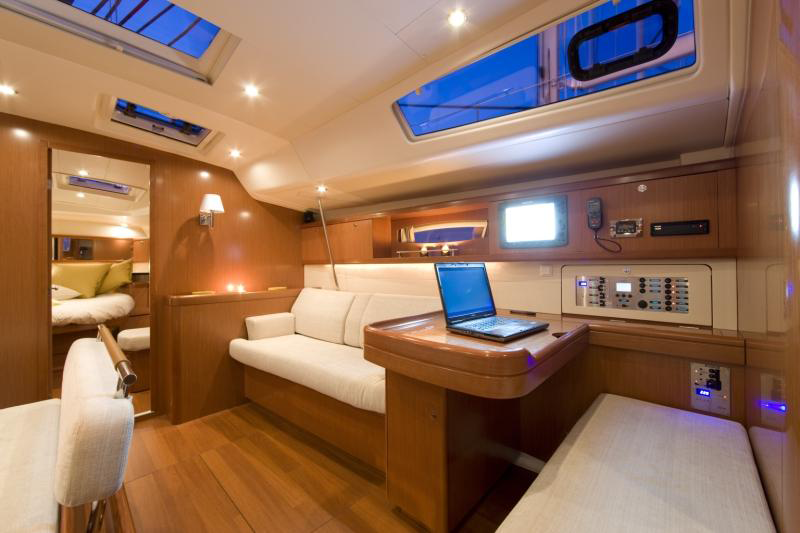 For your comfort in any weather the yacht features a generator and fully air conditioned interior. The baths include electric toilets and the aft toilet includes a separate shower area. The salon offers the convenience of two separate seating areas with a dining table that also converts to a berth if required. 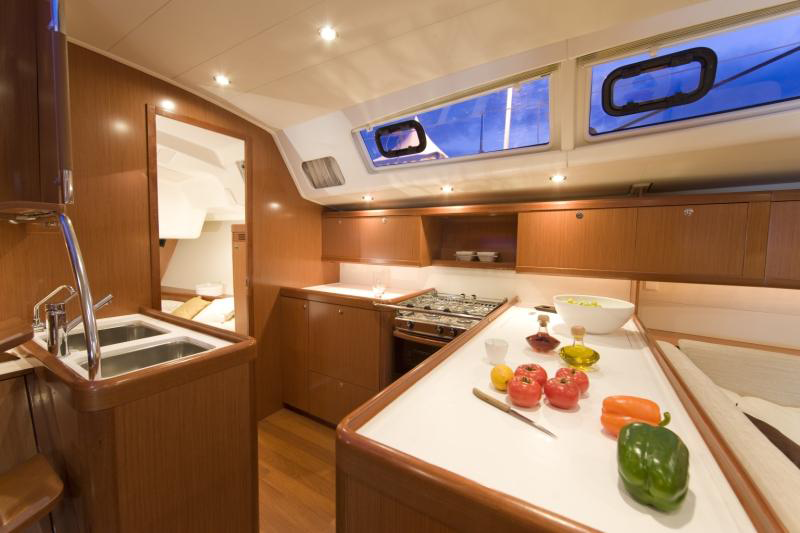 The galley extends along the port side with plenty of storage, counter space, double sink, 3 burner stove with oven and a large refrigerator. The salon is U-shaped and the table seats eight to ten people. A separate chart table is situated aft of the salon. 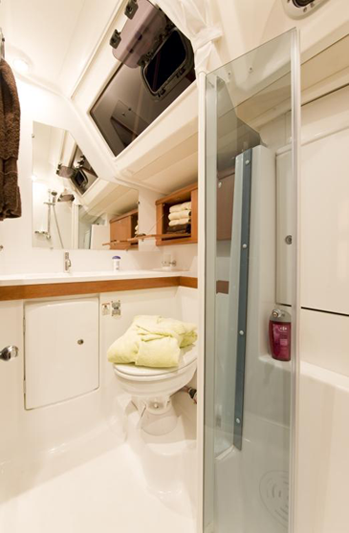 There are 4 double cabins, each with a changing area, hanging locker, opening ports and hatches, fans and individual reading lights. In the bow there is an additional single air conditioned cabin with toilet and sink that is accessed through a deck hatch.